So we heard you’re thinking about going fully independent. You’ve probably decided to get your own authority so you can cut out the middleman and keep more income for yourself while operating more independently. This is an exciting new step, but you’ll have to get your ducks in a row first. To become an owner operator with your own authority, you have to meet several federal and state requirements. You may also face state fuel and use taxes as well as local costs, such as parking rental. Remember, the above figures may have changed since the time of writing. Insurance will account for the majority of your increased expenses, costing anywhere from $8,000 to $16,000 per year. But hang in there! Your premium will gradually decrease as your business proves itself stable. This premium provides the federally mandated minimum coverage of $750,000. If you establish your independent trucking business as an LLC, you’ll provide an extra level of financial protection. How Do I Get Loads with My Own Authority? There are three main ways to obtain loads now that you operate independently. The first is to use load boards like HaulHound, DAT, Internet Truckstop and other online portals. These load boards allow you to pick and choose the best loads for you. Your second option is to build up your leads and contacts the old school way. Save the information of everyone you carry, ask for referrals, and keep an eye out for potential cold call leads. 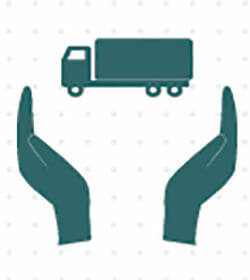 The third option is to use one or more designated freight brokers. These “middlemen” can help alleviate some of the hassle and paperwork associated with finding loads yourself. How Much Do Owner Operators Make? Don’t let the myriad of costs make your head spin. Owner operators with own authority can come out far ahead because they don’t have to share their profits with a lease firm. If you are working with a company, you are probably making an average of at least $50,000 before expenses. Obtaining your own commercial truck authority can allow you to make up to $141,000 before expenses. As an independent carrier, however, your overhead and related costs will be higher than you might expect.